BEFORE: The Fugitive will be fulfilling a few things today. First, it’s Harrison Ford’s birthday. Happy birthday. Second, this gives me a chance to follow up and see how Tommy Lee Jones’ Best Supporting Actor in 1993 claim compares to Leonard DiCaprio’s job in What’s Eating Gilbert Grape. AFTER: I don’t think I’ve had an adrenaline rush that big since watching episodes of 24. 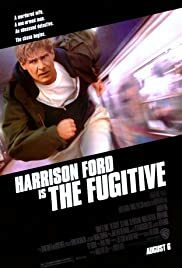 From beginning to end, The Fugitive is filled with countless chase scenes that are enough to keep the excitement level high. Add to that Dr. Kimble (Harrison Ford) trying to solve the mystery of who actually killed his wife (Kimble was tried and wrongfully indicted). And then combine all that with U.S. Marshals, led by Deputy Gerard (Tommy Lee Jones), trying to figure out why Kimble came back to Chicago instead of fleeing. With all this action jammed into this film, The Fugitive seemed to go by much quicker than its 130 minute runtime. Now there’s the question of Tommy Lee Jones’ acting. As I mentioned before, Jones won the Oscar for Best Supporting Actor for his role as Deputy Gerard. Jones did a good job, there’s no question about that. But I don’t feel Jones’ non-caring Deputy who won’t bargain with anyone was good enough to win Best Supporting Actor, especially compared to the performances given by Leonardo DiCaprio (What’s Eating Gilbert Grape) and Ralph Fiennes (Schindler’s List). It’s a tough competition but DiCaprio and Fiennes gave well above average performances whereas Jones gave an above average performance. Either way, you should watch this movie.